As a teenager, I loved going to Margate. Half an hour’s train ride from my home town of Faversham, the summer holidays would see me at the seaside town as often as I could. Long, sunny days spent at Dreamland (or Bembom Brothers, as it became during the 80s), an ice cream on the sandy beach, and buying cheap sunglasses and t-shirts from the souvenir shops in Arlington Square are forever etched in my memory. Margate may have changed in the last three decades, but with the renovation and re-opening of Dreamland last year, some fantastic artwork on display at the Turner Contemporary (Grayson Perry’s ‘Provincial Punk’ exhibition last summer was incredible), and an ever-expanding Vintage Quarter to peruse, that change is for the better. 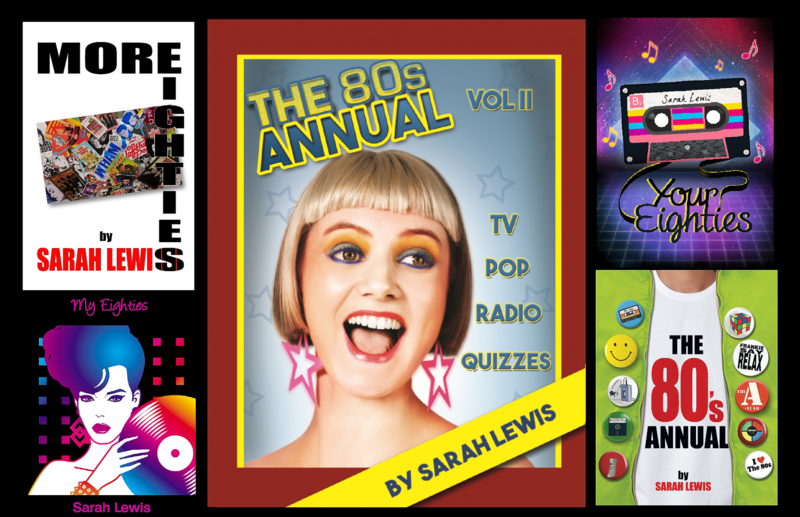 I have been invited to attend a Retro Event at one of the vintage stores thriving in this area of Margate, and will be signing copies of ‘Your Eighties’ from 2-4pm at Madam Popoff, on Saturday 30th April. However, I plan to be there most of the day to meet the celebrity guests who will making appearances throughout the day. I am also looking forward to meeting up with my fellow New Haven Publishing author, Garry Johnson, who will be signing copies of his book ‘Punk Rock Stories and Tabloid Tales’, and with Bob Bradbury from Glam Rock band Hello, who will be signing copies of his first solo CD album ‘Mad Affair’. Full guest list and timings will be announced nearer to the event, but it plans to be a fabulous afternoon for anyone with an interest in all things retro and vintage, with clothes and accessories from the 1940s onwards available for purchase. Entry is free, so come along and join in the fun – I look forward to seeing you there! Wednesday brings us the annual BRIT Awards, an event I have watched in eager anticipation since 1985, when it was first broadcast by the BBC. Known then as the BPI (British Phonographic Industry) Awards, and held at the Grosvenor House Hotel, the ceremony that year was hosted by Noel Edmonds. Like many of those presenting and receiving awards, he wore black tie for the occasion. Even champions of double denim, Rick Parfitt and Francis Rossi, w ere suited and booted. Set against a backdrop of silver and white sparkles, the message to the viewers was this is where the glamour was to be found. Any doubts we may have had were dispelled as soon as Prince took to the stage, to receive his award for Best International Solo Artist. What he lacked in words, he more than made up for in fur and frills. No wonder I fell in love with the ceremony, and have watched it every year since, albeit with a diverse variety of memories. Despite surviving on approximately two hours sleep a night, due to my daughter being only 9 weeks old, I remember the 1994 ceremony as being mainly about Take That. Although this could be because they still had hero-like status in my eyes, having topped the charts with “Babe” on the day she was born, saving my little girl from being born when Mr. Blobby was at Number 1. This was no mean feat, as the pink prankster had occupied the top slot both the week before she was born and the week after. My son arrived at the beginning of 1996, and as my world increasingly centred around the likes of the Telebubbies and Tots TV, The Brits became almost symbolic for me, a reminder of my first love – music. However, with acts like the Spice Girls and All Saints featuring heavily, the latter half of the Nineties saw me mostly interested in the Outstanding Contribution award, the winners of which included David Bowie, Eurythmics and The Bee Gees. I continued to tune in each year, even when I was pretty clueless as to who half the nominees were. By the mid-Noughties, the kids were helping me differentiate between Busted and McFly (I was obviously ahead of the bands with the McBusted idea!). When the 2008 awards came around, I found myself enjoying parts of the event almost as much as I had back in the day. Okay, so Earls Court was never going to measure up as a venue. Ditto to the sweary Osbornes as hosts. However, the look on Paul Young’s face as the Arctic Monkeys, dressed in country squire attire, walked past him to collect their award for Mastercard Best Album was priceless. Then there was Mark Ronson’s performances with Adele, Daniel Merriweather and Amy Winehouse. The Brits was getting its act back together. Whilst I may never view The Brits with the same enthusiasm I did in the Eighties, this year I will be rooting for James Bay, whose ‘Chaos And The Calm’ album is a current favourite of mine. I shall also be enjoying the combination of nominees, the strangeness of which remains reassuringly unchanged over the years. Perhaps the best example this year is those nominated in the British Group category: Blur, Coldplay, Foals, One Direction, and Years & Years. I can’t wait to discover who emerges victorious from that curious ensemble. One legacy of growing up in the Eighties is believing that each and every one of us can make a difference. Whether it was going on protest marches, taking part in various sponsored events (the sponsored swim I did at school in the mid-Eighties is forever etched in my mind, as there was a thin layer of ice on the water surface of our outdoor pool, which had to be broken before we could get in to do our lengths!) or buying a charity record, we firmly believed that our efforts could, in some small way, change the world. In today’s fast-paced climate, where technology seems to rule, and information overload can make a fundraising appeal seem like more white noise, how do you make yourself heard? The honest answer is, I don’t know. All I can tell you is what I know to be true. Firstly, there can be very few of our generation who has been unaffected by cancer, and the devastation it leaves on both the sufferer and their family. Secondly, no matter how small your contribution, it will still make a difference to changing the lives of others for the better. Which is why I want to bring your attention the fundraising efforts of David ‘Gnasher’ Nash. Some of you may already be familiar with Norwich-based Gnasher’s murals and street art, such as this memorial piece of Robin Williams. More of his work can be viewed on Gnasher’s website, through which he can be contacted regarding prints he is selling to raise money for Colchester Cancer Centre. To further ensure that “Cancer Can Do One”, donations can also be made via his Just Giving page. What difference does it make? You’ve only to look to your 80’s self for the answer.